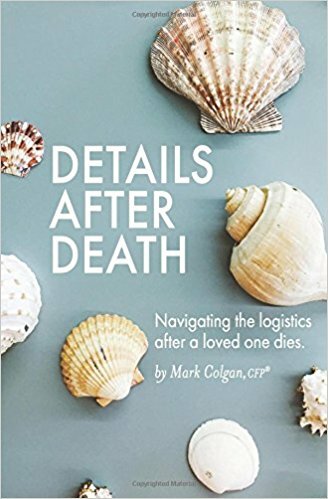 In addition to creating My Wisdom Will, Mark Colgan has also authored a wonderful book to help people navigate the logistics after a loved one dies. The book, Details After Death is an invaluable resource when you’re experiencing the loss of a spouse, partner, parent or child. It will lead you through all the logistical details that follow death–legal, financial, practical and personal. This detailed roadmap will help you save time, effectively manage the mountain of paperwork you’re faced with, and safeguard your financial future. Once a widower himself, Author Mark Colgan understands the unique financial needs and overwhelming emotional challenges you face in the aftermath of losing a loved one. This personal understanding, combined with over two decades of wealth management expertise, allows him to help bereaved survivors build a secure foundation for a promising future. Buy it online today from Amazon.